To effectively protect the body from a wide variety of potential threats, the immune response must constantly adjust to target the unique characteristics of individual disease states. This flexibility and specificity are what define the adaptive immune system and provide the driving force behind protective immunity against cancer. To take advantage of this adaptability, vaccines and immunotherapies attempt to activate and “educate” immune cells to recognize and eliminate cancer cells. This approach has already transformed cancer treatment by delivering therapies with great power to eradicate tumors while sparing healthy tissues. 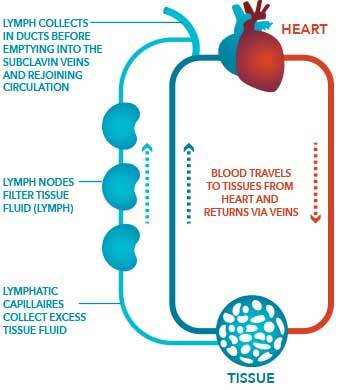 And while these successes have demonstrated the power of retargeting the immune system against cancer, first-generation therapeutics are distributed widely throughout the body via blood flow, allowing only limited interaction with immune cells that reside in the lymphatics. Poor targeting of immune cells often requires such therapies to be given at high doses, which produce body-wide immune activation and significant toxicities. For this reason, these traditional approaches have had limited efficacy. In order to fully realize the potential of this approach, the next generation of vaccines and immunotherapies must precisely target the natural centers of the immune response – the lymph nodes – to orchestrate and stimulate powerful, effective anti-tumor immunity. The lymphatics, with its network of interconnected vessels and nodes, form the brain center of the immune response, an information superhighway where immune cells diagnose potential threats and coordinate protective responses against disease. The lymphatics, with its network of interconnected vessels and nodes, form the brain center of the immune response, an information superhighway where immune cells diagnose potential threats and coordinate protective responses against disease. By designing vaccines and immunotherapies for precise delivery to the lymph nodes, we can target them directly to the immune cells where they can do the most good while preventing toxicities arising from systemic distribution. Using this approach, Elicio is pioneering the effort to more effectively orchestrate the immune response to defeat cancer.